MENOMONIE, Wis. – Sept. 24, 2014 – StrandVision Digital Signage has enhanced the core customer administration pages of its Digital Signage Content Management System (CMS) portal to include iconic representations of the different types of page content that can be chosen for display, more responsive administrative management and highly context-specific recommendations for missing or incorrect entries. Error detection - StrandVision now offers highly detailed error detection and reporting that automatically and quickly identifies input errors and missing information and offers context-specific recommendations on how to address the issue or improve the content being displayed. The system verifies that all of the administrative steps are corrected prior to publishing the changes to the digital signage network. "We've worked hard to make StrandVision Digital Signage an iconic company to our customers with excellent products, service and support," offered Mike Strand, StrandVision founder and CEO. "Now we're taking it one step further with an iconic approach to our content development and management. As always, our objective is to make it as easy and efficient as possible for non-technical staff to handle the daily, weekly or monthly management of the StrandVision electronic signage system. These are just another in the long line of improvements that we've made to our customer experience over the last 11 years." Learn more by checking out the introductory video at http://youtu.be/jAwGgfy5idc. StrandVision LLC, based in Menomonie, Wis., delivers low-cost, cloud-based digital signage software content to subscribers' digital media player displays, as well as computer screens, websites and mobile devices. 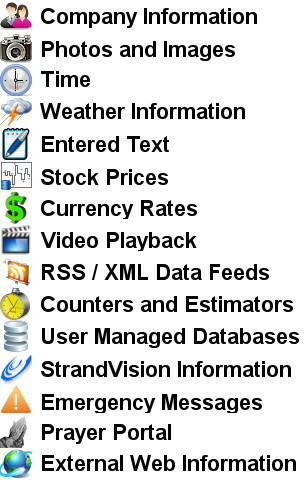 StrandVision's patented approach distributes customer created text, graphics, videos, RSS/social media feeds along with pre-packaged worldwide, national and local weather and news. It is ideal for many business marketing applications for waiting rooms (patient and customer information); banks and retailers (video merchandising); education (student, staff and visitor information); business and industrial settings (employee communication and operational/performance information); as well as nonprofit and religious organizations (member and supporter communication). StrandVision also offers supporting digital signage hardware including PC-2-TV.net, a fully digital, high-definition (HD) video extender for long distance multi-screen distribution, Linux digital media players to ease and optimize electronic signage network installation and several large-format displays including freestanding pedestal displays. StrandVision Digital Signage services, installation and equipment are available directly from StrandVision and through registered affiliates and system integrators. Additional information about StrandVision Digital Signage is available at StrandVision.com, 715-235-SIGN (7446) or by emailing sales at StrandVision.com.